Having lived in Venice for several years in her early twenties, Susan was introduced to Loretta after a meal at Pani’s and the pair would often catch up over a coffee or bowl of pasta so Susan could practise her Italian. It was during one of these meetings that Loretta mentioned she knew a publisher in Italy who she would love to introduce Alan and Susan to, with a view to publishing a book of his work. With their gallery on Main Street in Ponteland now well on its way to being well established, the couple were looking forward to the future of Alan Reed Art and decided to meet with the publisher, Alberto Brazzale in Rome in September 2004. Meeting Alberto for the day at the hotel where they were staying in the Trastevere area, he talked confidently about his previous work and explained how he sought sponsorship from local companies and banks in Italy to publish his books. Giving Alan and Susan some exciting ideas to go home and discuss, Alberto also suggested some new locations Alan might like to visit and paint to add to his collection of Italian paintings. After their meeting with Alberto the pair were off to Umbria again! This time, they would be meeting their good friends Bob and Heather at Rome airport and heading two hours into the sunset to Umbria to stay with Chrissie and David at Casa San Gabriel. Cultural heritage is not Umbria’s only selling point – this produce-laden province is beloved by Susan in particular for the wild boar and truffles of its woods that grow in abundance here. Umbria is rustic, rural, romantic Italy at its undiscovered finest, where sheep roam free in the unspoilt valleys and medieval villages and landmarks that dot the landscape. Alan and Susan wasted no time in introducing Bob and Heather to the area – driving along its winding roads to the foot of the Sibillini Mountains and onto the wild and wonderful Piano Grande basin where lentils grow in abundance and a patchwork quilt of red, purple and blue wildflowers carpets the view below during the summer months. Unquestionably one of the most spectacular sights in the area, the scenery and the silence up here are exhilarating no matter what time of year you visit. The foursome stood still, drinking in the view. For Alan, it was a wonderful opportunity to sketch and catalogue some of the world’s most far flung locations that would delight customers at the gallery. Despite their wonderfully rural location, Susan spotted a small caravan parked up in the distance serving sandwiches and light lunches. They decided to stop for lunch here and headed over to the mysterious caravan…. Greeted with wild boar sandwiches and a glass of wine, Alan, Susan, Bob and Heather enjoyed a fantastic lunch at the top of the Piano Grande basin – one they still vividly remember today. Spending a week together touring the sights of Tuscany and the Umbrian Valley, a little over an hour’s drive from Casa San Gabriel took the group everywhere. From the pretty hilltop town of Cortona to chocolate and salami shops in Norcia and onwards to the peaceful mediaeval town of Gubbio on the slopes of Monte Ingino. Their base at Casa San Gabriel, nestled deep in the Umbrian Valley proved a perfect spot to stay – Chrissie and David were the perfect hosts and opened up their own home for dinner one evening on the terrace of their home with breathtaking views of the valley where Bob and Heather celebrated their 25 th wedding anniversary and Bob presented her with a beautiful ring to mark the occasion. Shortly before their trip came to an end, the foursome discovered the crumbling ruins of an old church tucked away just a ten minutes walk from where they were staying. While Alan sat and sketched the ruins, Susan and Heather sat in the sun and chatted about how wonderful it would be to have the money and time to renovate the church and make it into something…. 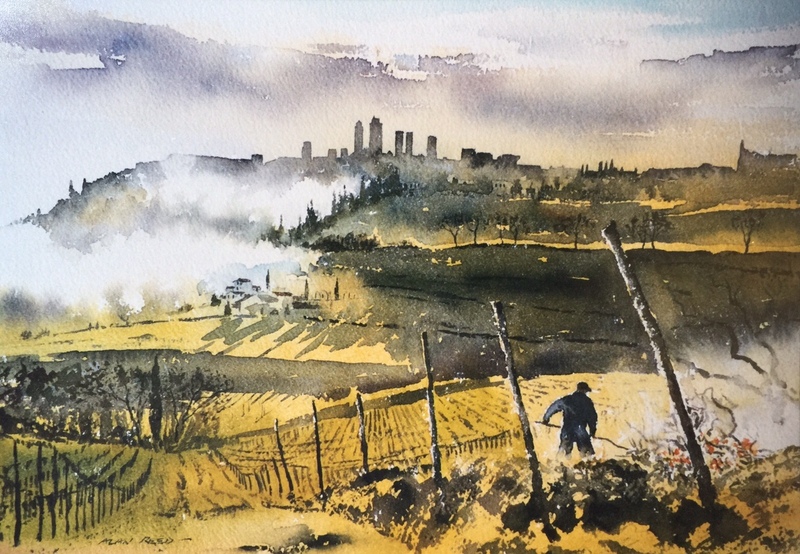 Returning from their first trip to Umbria in 2002 feeling refreshed, Alan and Susan focused their efforts on the new Alan Reed Art Gallery just a stone’s throw from their home in Ponteland. The gallery quickly became a go-to destination in its pretty village location amidst the local coffee shops and village pubs. Alan continued to receive a number of interesting commissions during this time – one memorable commission in particular was for banking group Northern Rock, who commissioned a series of paintings of Northumbrian castles for their boardroom. Warkworth Castle by Alan Reed – one of the castle’s in Alan’s collection available to purchase as a limited edition print. Fast forward to May 2003 and the couple began to get the travel bug once again. Alan’s ever-expanding Italian Collection of paintings continued to sell exceptionally well and so the couple decided to embark on a new adventure to the Amalfi coast and Sorrento. Looking up prices online, Susan found a fantastic deal that would take them to the cerulean coast for a week’s sightseeing and research, but at £1,500 for the pair they jokingly asked God that if he wanted them to take this trip, someone would come into the gallery that afternoon and buy a painting to fund their trip. As luck would have it, their prayers were answered! They sold two original paintings that afternoon of Italy which went towards their trip. Ravello, an iconic scene from the Amalfi coast. With its pastel coloured fishing villages, glittering coastline and clifftop olive groves, the Amalfi coast certainly didn’t disappoint. Moving on to soak up the culture in Sorrento, Pompeii, Rivoli and Capri; Alan and Susan saw as much as they could in a week, including a fascinating trip to the oldest paper mill in Italy where Alan was gifted a few sheets of paper from the master craftsmen which resulted in a painting of the iconic Colosseum. 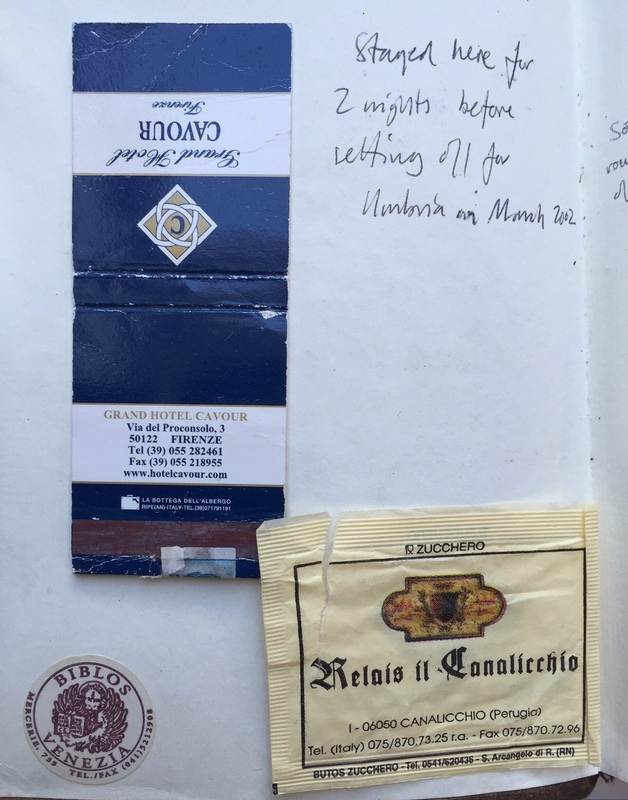 Having purchased a selection of handmade sketchbooks whilst in Fabriano, Umbria, Alan continued his new method of cataloguing his references in these pocket sketchbooks during their trip to Sorrento and the Amalfi coast. During the early years of his career, Alan vividly remembers his artwork being featured on local news programme BBC Look North. Reporting at the time, broadcast journalist Wendy Gibson mistakenly mentioned that Alan painted without a pencil – which certainly sounded impressive, but wasn’t quite true in Alan’s case. It wasn’t until Alan naturally felt inspired to adopt this new method of painting directly into his pocket sketchbooks during this trip that reminded Alan of this news report and signalled a sort of rebirth in his method of painting. 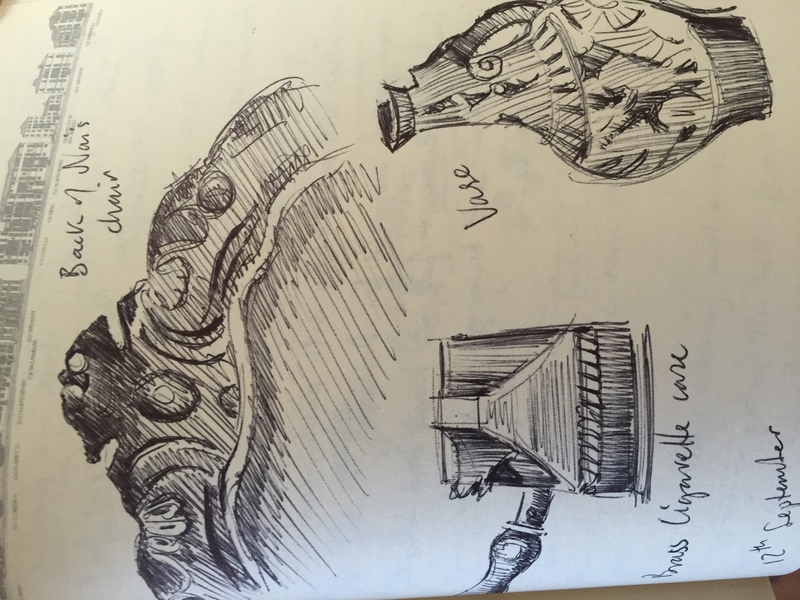 As life got back to normal at the gallery after their trip, Alan uploaded pages from his sketchbooks to his website. From quick painterly sketches of scenes before him, to little anecdotes of their trip (like the time their bus driver concentrated more on a pretty female passenger than the winding roads up to Positano) the sketchbooks had, in a way, become unique photo albums of his travels and varied from Umbria, Venice and Florence. 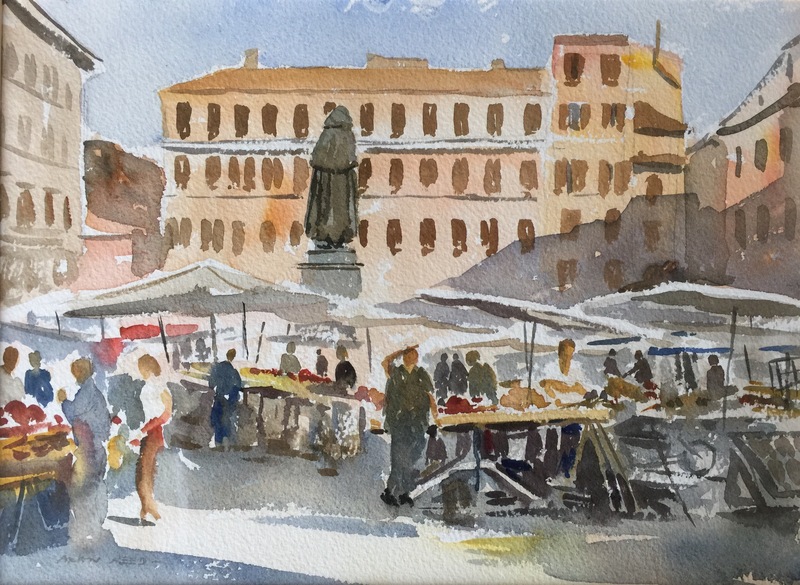 One of the joys of being an artist is never knowing what opportunities are going to come along – and for Alan, an exciting opportunity to return to Italy had just popped into his inbox. Chrissie and David had escaped the rat race and purchased four derelict 16th century dwellings in the Umbrian Valley, transforming one into their home and the remaining three into beautiful self-catering cottages. With panoramic views from the terrace of the valley beyond, Chrissie and David invited Alan to recapture the beautiful scenery for customers to enjoy on postcards and in the cottages themselves at Casa san Gabriel. Rosso e Nero, inspired by the couple’s trip to Venice February 2004 featuring the Rialto Fish Market and is available as a limited edition print. Alan and Susan jumped at the chance to return to Umbria, where they had once laughed about being snowed in despite the sunny weather the day before and organised the trip to coincide with a trip to Venice with Alan’s parents in February 2004. Gathering more reference of the iconic Venetian carnival whilst there, Alan and Susan introduced his parents to some of Susan’s friends Franca and Massimo who live on the outskirts of Venice and of course to much loved old friend Nai whose story you can read more about here. From there, the family went their separate ways – with Alan’s parents heading back to England and Alan and Susan catching a train to Umbria where Chrissie and David would pick them up from the station and take them to the cottages. Alan and Susan stayed for just one night which gave Alan a short window in which to take reference of the cottages to produce a sketch for Chrissie and David at a later date, but it took even less time for the couple to fall in love with the beautiful cottages and view here. Surrounded by the Umbrian countryside, Casa San Gabriel had been thoughtfully furnished by Chrissie and David and Alan and Susan knew they would be back. As it turned out, the couple have returned to Casa San Gabriel on a number of occasions over the last ten years and witnessed the cottages evolve with an outdoor pool, landscaped garden, BBQ facilities and a soon-to-be-completed winery. Alan and Susan also got to know the couple’s two young daughters Eli and Lucia over the years and always make a trip to see the family when they are visiting the area. As the gallery in Ponteland blossomed, so too did Alan and Susan’s love for Umbria, thanks in part, to Chrissie and David’s vision for Casa San Gabriel. Chrissie and David also took on an old church just a short distance from their cottages as the years passed – managing it alongside their own cottages. The Chiesa del Carmine left a lasting impression on Alan and Susan – although in a sorry state at the time, they kept an eye on the church during its planned restoration and an idea began to form in their heads – wouldn’t this be an amazing place to bring guests on a painting holiday? After Susan’s kidney transplant in the year 2000 and a phenomenally successful summer at the Alan Reed Art Gallery in Eldon Gardens, Alan and Susan could both, at last, look forward to the future with a sense of security as post-transplant life for Susan was getting brighter each day. Indulging in their shared love of travel was of course top of their list. During this time a member of their congregation, Christine, told them about a prophetic dream she had about the couple. The dream carried the message that God was going to uproot them and she had the word Jubilee, which in the Biblical sense refers to a concept of ‘jubilee’ a time when debts were cancelled. Perhaps most peculiar of all, Christine could vividly see a house in her dream, in which Alan was visible upstairs putting sold tickets on various paintings. Downstairs, there were “For Sale” signs in the window. Neither Christine or Alan and Susan knew what any of it meant. Not long after, the couple were unexpectedly called into a meeting with the management of Eldon Gardens. They were to be given one month’s notice to pack up the gallery and find a new unit to rent as management had found a new, higher bidder to pay for the space. Suddenly their whole livelihood and future was thrown into uncertainty. The gallery had been doing exceptionally well – customers were already earmarking paintings for Christmas gifts and Alan’s artwork was earning a fantastic reputation across the region. Despite the sudden shock of having to close the gallery in Eldon Gardens and look for new premises, Alan and Susan remember feeling nothing but a remarkable sense of peace. Did this have something to do with Christine’s dream, they wondered? The gallery closed its doors after six years in March 2002, giving Alan and Susan a renewed sense of freedom. Until they decided where to open a new gallery, they were technically free to do as they pleased. It had been so long since they had been to Italy together due to Susan’s ill health, they decided to book a trip to Italy’s “green heart” – the lush valleys of Umbria, an Italian region bordering Tuscany, Lazio and Le Marche. Beloved for its medieval hilltop towns, dense forests and local cuisine, particularly foraged truffles and wines, Umbria would be a new adventure for the couple – little did they know that this would be the start of a very special relationship. Alan and Susan had booked to stay in the Relais il Canalicchio, a picturesque hotel overlooking olive groves and rolling countryside. As they drove along the winding drive and enjoyed a simple supper of tomato and mozzarella salad on the patio in the warm evening sun: it was the perfect retreat Or it was, until they woke up the next day snowed in! Waking up to blankets of snow carpeting the rolling hills they had admired only the day before in t-shirts, Alan and Susan found themselves snowed in for the day unable to go anywhere. Instead, they explored the hotel, the kitchens brought warming soups to the guests and Alan sat by the log fire and sketched. 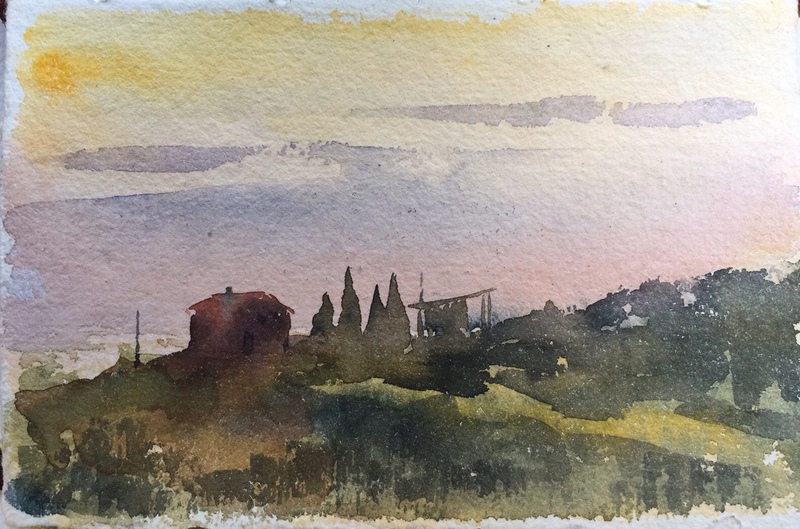 Life had been such a struggle lately with Susan’s illness and now the gallery being uprooted, they had the opportunity to sit back and enjoyed a slower pace of life here in Umbria. Blessed with endless beauty spots and inspiration for Alan’s Italian Collection of paintings, his working method even began to change. Having previously used a watercolour block (a pad of pre stretched watercolour paper) to paint, Alan would sometimes lament the fact that his reference of that place, or moment in time was lost once the painting was sold. He would work carefully in pencil sketching various features and scenes, but after a day trip to Fabiano, he decided to buy a selection of leather bound sketchbooks which fitted neatly in his pocket. 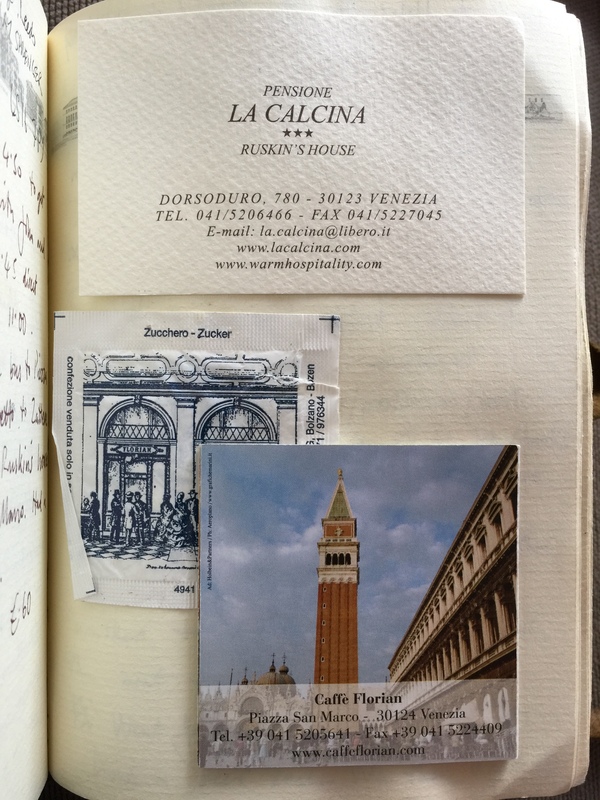 The region of Fabriano has a long heritage of making paper for Italian bank notes and Alan immediately fell in love with these beautiful, distinctive sketchbooks. 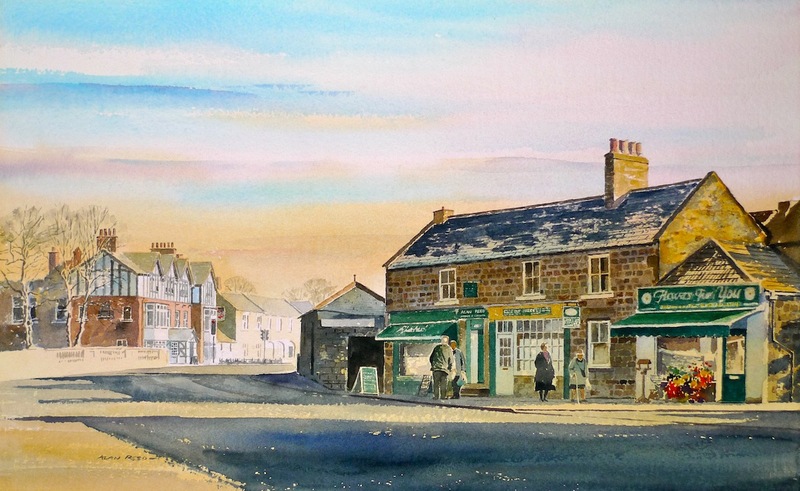 Instead, Alan now found himself working directly with a brush filled with watercolour paint as he painted various scenes in his new sketchbooks. A type of shorthand for himself, Alan could record what he saw and paint it larger on a sheet of stretched hand made watercolour paper whilst still keeping his original references. 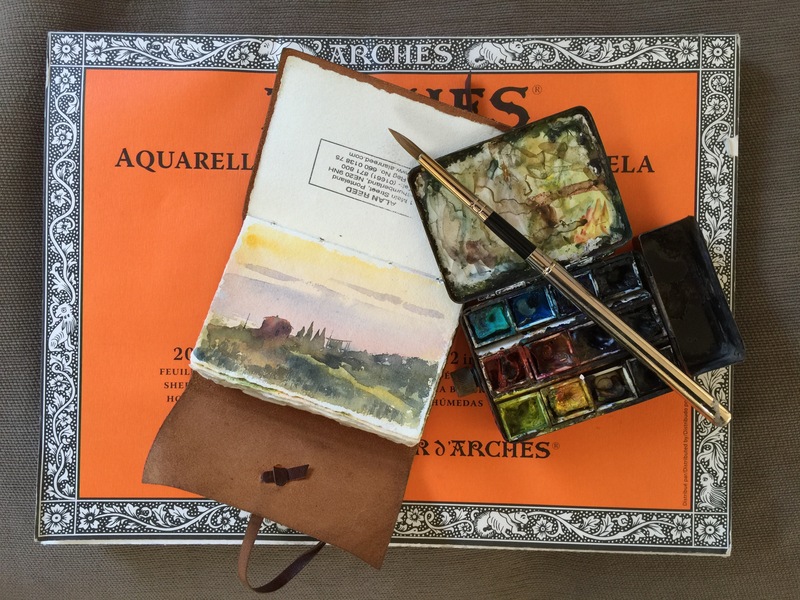 Old methods of painting solely using a block and new methods of painting in pocket journals. The sketchbooks were a catalyst in bringing back memories of the beautiful places he’d visited and remain so today. Umbria also refreshed Susan’s love of food and cooking. Often, Susan would look out for unusual oils or ingredients you couldn’t buy at home to recreate real Italian flavour in her dishes. Prior to this trip, the couple had been given a bottle of truffle oil as a gift but didn’t enjoy the flavour. Known for its rich source of truffles, Umbria completely changed the couple’s feelings about truffles as they were served them in pasta and sauces, on bruschetta and even scrambled eggs in the morning. Suddenly, they couldn’t get enough of it and even today they still love truffles – the taste taking them back to their very first trip to Umbria in 2002. Umbria was a fantastic tonic for both Alan and Susan, and it’s little surprise why it is their chosen location for their Reedart Italian Painting Holidays. For Susan, it was a trip mostly spent curled up fast asleep in the back of the car while Alan drove, unable to fully enjoy the sights they had looked forward to – as Alan sketched “en plain air”. Having been diagnosed with polycystic kidney disease – a hereditary disease, she was slowly but surely suffering from kidney failure. Susan bravely faced the difficult task of coping with nausea, headaches, extreme exhaustion and painful cramps. Their trip to Florence in February 2000 was certainly a turning point for the couple – their shared love of travel was suddenly cut short as Susan became too poorly to enjoy the adventures they had planned to take together. The Alan Reed Art Gallery in Eldon Gardens was busier than ever, which meant a trip to Rome without Susan, so Alan accompanied by his mother in 2001, to gather more inspiration for his exceptionally-popular Italian Collection of paintings which still resonate with lovers of the country today. Since the kidneys are capable of functioning at up to 10 percent of their normal capacity, Susan hadn’t realised how ill she was until now. Faced with dialysis three times a week or a kidney transplant – something had to be done soon to rid Susan of the toxins in her body. To make the situation even more difficult; Susan has a rare tissue type which made finding a transplant match virtually impossible. With only three percent of the population predicted to be a match due to Susan’s French and Maltese heritage, Susan’s mother stepped in eager to help. It was at this point that Alan insisted that he get tested to see if he could be a possible match too. Remarkably Margaret was not a match, however the couple were amazed when Alan turned out to be a 50 percent match! A twist of fate so beautiful and rare – Newcastle’s Freeman Hospital who undertook the operation told the couple that out of the estimated 120 kidney transplants they perform each year, there have only been 15 husband and wife matches since 1996. Because Alan was going to be a live donor, it didn’t matter that the kidney wasn’t a 100 percent match – the couple’s faith and prayers gave them confidence that the transplant would be a complete success. Born-again Christians Alan and Susan underwent surgery on June 27th 2001, with the power of prayer and faith in God. The couple recovered in adjoining wards, with Alan deemed fit enough to be discharged just four days later. Susan would be on anti-rejection drugs and steroids for the rest of her life, but with a knowingly smile she knew that the kidney transplant was going to be a success, having felt it “burst to life” almost immediately. Fast forward 14 years and Susan is still in good health. The kidney transplant was a fantastic success, giving Susan the chance of a normal life and bringing the couple even closer. Remaining by each other’s side during highs and lows, the couple were now free to pursue their love of travel and the adventures that would come their way – resulting in their beloved Reedart Italian Painting Holidays. There are people we meet throughout our lives that leave an inexplicable mark on us. These people shape us in wonderful ways and guide us through some of the darkest storms we face. Nai is one such person for Alan and Susan Reed. Almost like a second mother to Susan, and a delightfully enigmatic and wise lady, now in her eighties – this is the story of Nai. Navigating a new world with her two young children Louise and Oliver as a young twenty-something herself, Susan rented a small apartment at the top of Via Garibaldi for her young family after moving to Venice in 1983. A beautiful old building in the Castello District, it wasn’t long before Susan was introduced to the lady who lived in the apartment above – a hardworking Italian housewife and mother of two sons. Taking Susan under her wing almost immediately, Nai adored Louise and Oliver and helped Susan learn the language. It was the perfect friendship – Nai took Susan and the children to places across Italy they could only have dreamed of. Picnics in the park, to Dodges Palace – one of Venice’s gothic landmarks and across to Burano Island, famous for its lace and coloured houses – just to name a few. 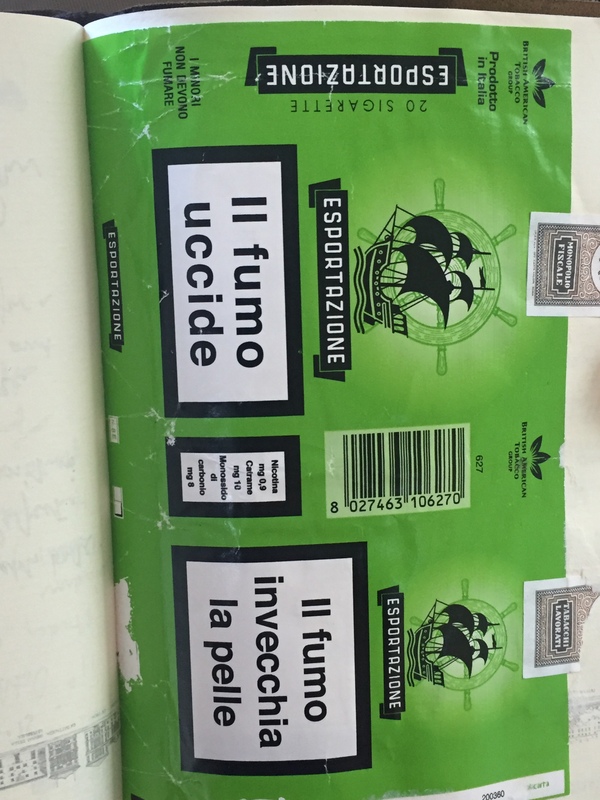 Once the children settled in at nursery, Susan would spend many mornings accompanying Nai shopping in the hustle and bustle of Venice – to the barge on the canal where they would buy the most succulent fresh fruit and vegetables, to favourite lesser-known bakeries, and to the tabaccheria for her cigarettes “Esportazione” (the same brand that she had smoked since the war) before heading back to her house to cook lunch for Nai’s husband Mario. Nai’s home in Via Garibaldi was very much a traditional Venetian family home where much of the furniture belonged to older family members who lived there previously and kept in immaculate condition. Alan took great delight in sketching the various rooms and corridors of this old house during the couple’s visits many years later. Giving Susan a first-hand experience into the wonderful family values and Italian culture is something she’s never forgotten. Whether through watching Nai’s mother in law, the head of the household sewing intricate swatches of lace by hand for the family’s bedding and linen, or the unforgettable dishes Nai taught Susan to cook from scratch. 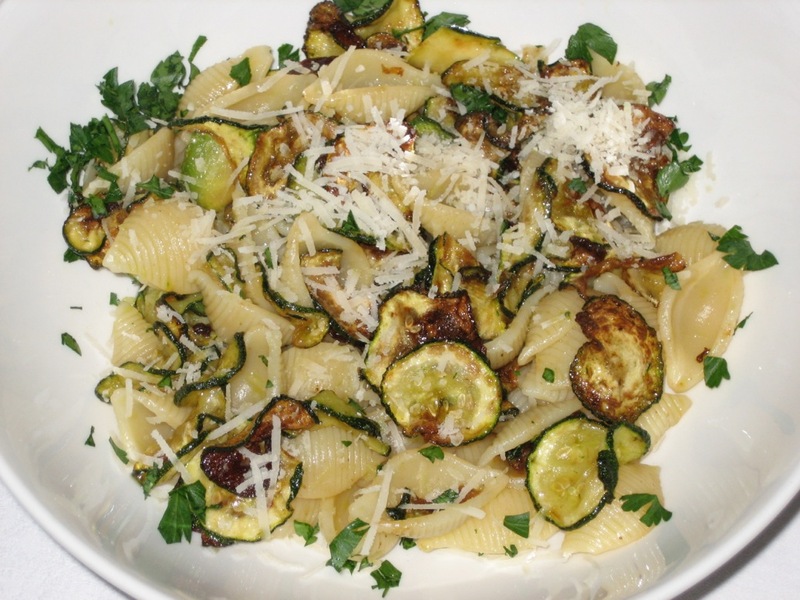 From fresh artichoke hearts – “carciofi” floating in salted water and divine when cooked, to a simply delicious starter of zucchini and pasta, drizzled with fresh lemon juice, olive oil and parmesan. Wine was always enjoyed with every family meal, followed by a caffe corretto – espresso and Nai’s favourite tipple – a shot of grappa. A fiery spirit, grappa is fondly remembered as the liquid courage carried in Italian soldiers’ flasks in World War One to sanitise their drinking water, warm them up and lift their spirits. 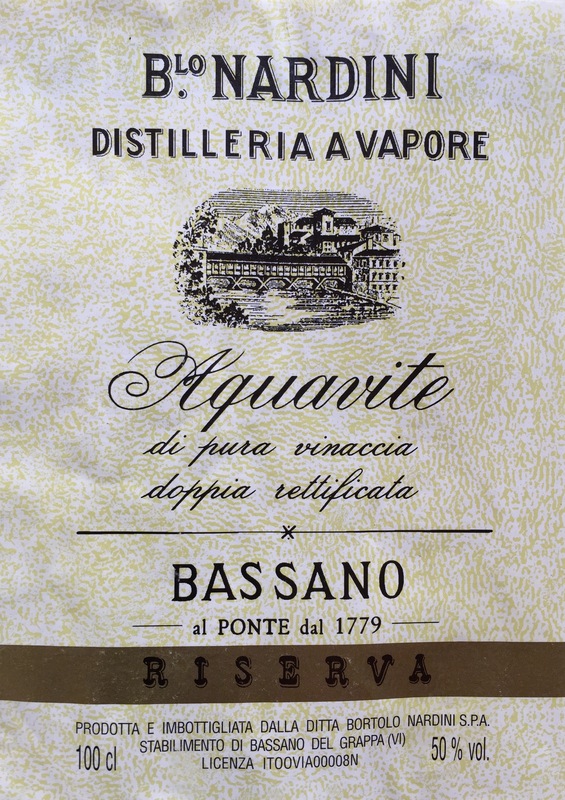 While its common name is “grappa”, the drink’s formal title is acquavite di vinaccia, derived from the Latin aqua vitae, or “water of life” – Nai remains a figurehead of her family even now in her 80s – perhaps thanks to, her water of life! Susan couldn’t have had a better teacher in Nai, and it’s no surprise that when she decided to return home to England after five incredible years, they remained close. Returning to Venice often and sometimes with with close friends such as John and Liz Wilthew in 2007, it was Nai who saved the couple time and money by purchasing tickets to the famous Teatro La Fenice, before welcoming the group to her home the next evening for a fabulous family meal – a perfect example of how fond Nai and Susan had become of each other. Alan and Susan often stayed with Nai on their trips to Venice over the years, and one trip in particular to the Dolomites in 2006 remains sharp in their memories. 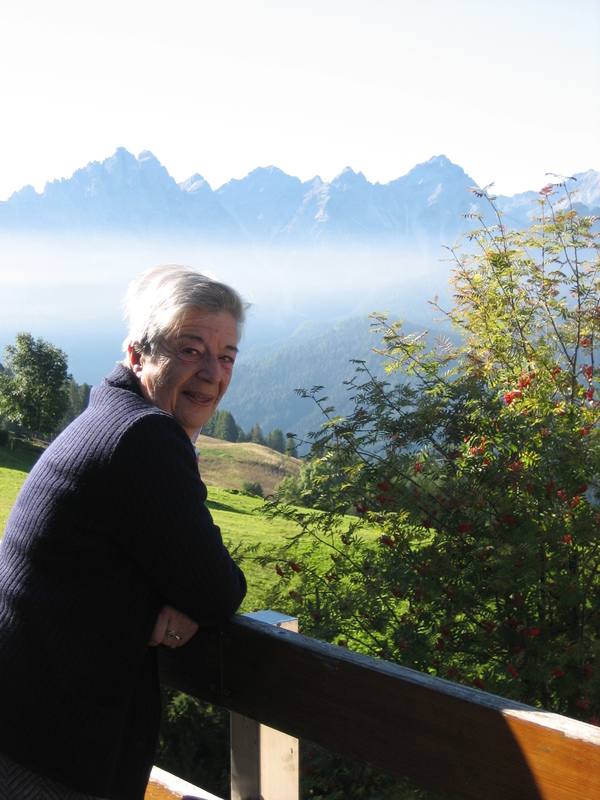 Knowing the Dolomites like the back of her hand, Nai and her sister used to explore the mountains in the North Italian Alps every summer in their youth. The family owns a beautiful rustic chalet in the area, and so Nai invited Alan and Susan to come and stay with her one year. Now in her 70s, Nai would fervently send the young couple off out into the mountain range for a days’ exploring – sharing invaluable tips of where the best place to catch the sunset was or stop for a picnic for lunch. As if by magic, the stony grey and white mountain range would light up a beautiful shade of pink before falling into darkness and giving way to a starry night sky, providing incredible scenes of inspiration for artist Alan. As is tradition in Italian culture, Alan and Susan would drive off in the morning to explore but return to Nai in the evening – calling her at ten to eight on the dot so she could put the pasta on as part of the meal for them to enjoy together as they arrived home. Alan recalls fondly being asked to make the coffee after dinner, a sure sign that he was officially one of the family. Nai’s kindness and compassion has never wavered over the years, despite the thousands of miles that keep the old friends apart. Whenever Alan hosts an exhibition of his artwork, he dutifully sends Nai an invitation – which she fondly keeps in her bedside table as a way of keeping up with the couple’s news and adventures. Despite her husband Mario sadly passing away over 20 years ago, Nai remains a wonderfully independent lady. She leaves Venice for a month every August to enjoy the cooler weather in the Dolomites, or packs up her famous tiny suitcase (containing little more than a clean blouse and her essentials) and travels across Italy, often to Rome to stay with nuns and enjoy a simple meal while she soaks up the history of her beloved country. Susan’s much-loved personal tour guide, confidante and wise old friend; Nai has been an integral part of Susan’s adulthood, giving her a taste of the flavours of life and cementing her love of Italy which in turn has inspired the couple to create Reedart Italian painting holidays. Flanked by sprawling vineyards, olive trees and succulent lemon groves; Lake Garda is Italy’s largest lake and an area of such outstanding natural beauty that it makes almost everyone’s to-do list when planning their sightseeing adventures across Italy. Alan and Susan first visited Lake Garda on a week-long trip with two friends, Bob and Heather in September 1999. Though not a research trip, unlike their previous trip to Rome to discuss the possibility of showcasing Alan’s ever-expanding Italian Collection of paintings, Lake Garda proved to be a bountiful source of inspiration for Alan – none more so than the popular beauty spot Limone, situated on the North West shore of Lake Garda in Northern Italy. Hiring a car for the day, Alan and Susan drove to Vicenza in Northern Italy – a city off the beaten tourist track but one bathed in history and splendour nonetheless. It was on this trip that Alan and Susan had the opportunity to meet up with old friend and Pastor Paul Finch, his wife Elaine and his family whom she was close with whilst living in Venice several years previously. The trip was a chance for Alan and Susan to explore more of Italy’s history and heritage together, providing Alan with a unique source of inspiration for his collection of Italian paintings which remained hugely popular both in originals and Alan’s new limited edition series of prints. Fast forward to the long-awaited millennium and Alan and Susan were preparing for another trip to Florence to celebrate their wedding anniversary. Their plan was to hire a car whilst there and visit Siena, a city in the centre of Tuscany dominated by magnificent medieval architecture and true Italian spirit. 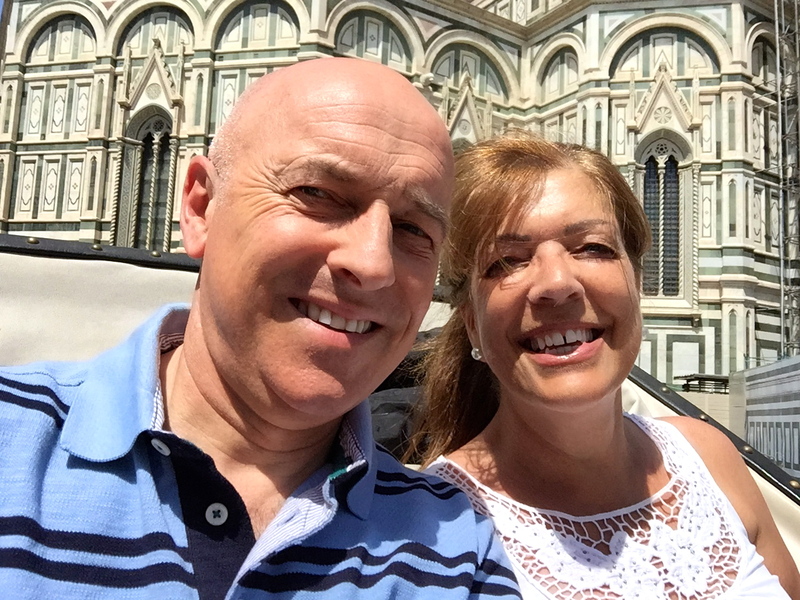 Alan and Susan had booked to stay at the beautiful Hotel Paris in Florence on this trip, just a stone’s throw away from Florence Cathedral and the city sights – a perfect way to celebrate their 7th wedding anniversary. Alan and Susan’s love for Italy has only deepened over the years, especially after these early years of exploration – in sickness and in health the couple have made wonderful, lasting memories. Susan remembers spending much of their trip curled up fast asleep in the back of the car, as she was beginning to suffer from kidney failure. 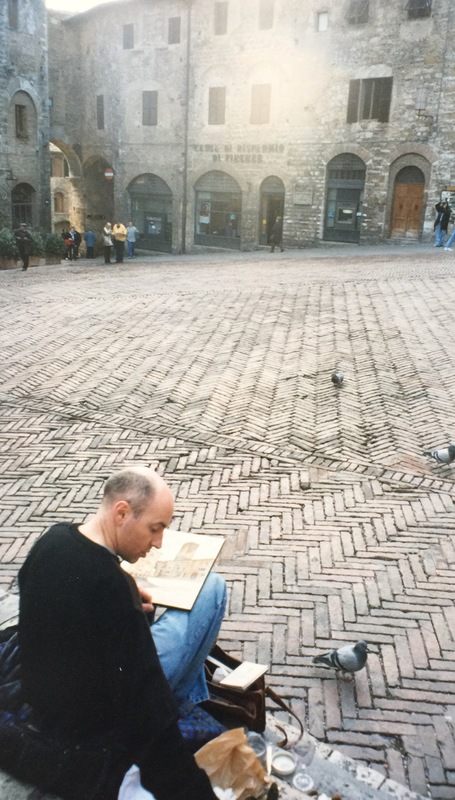 A husband and wife team through and through, Alan remembers one day in particular during their trip to Siena in which he pulled over and sketched by the side of the road in San Gimignano as Susan slept soundly, resting in the back of the car. Having caught sight of local workmen burning olive branches, a painting he would later complete known as Burning of the Vines. The couple’s adventures across Italy provided Alan with some fantastic references for his popular collection of Italian paintings – along with wonderful memories sitting people watching in busy piazzas, relaxing by the shore of Lake Garda and impromptu sketching of some truly unique, real scenes of daily life in Italy. The sounds of laughter, chairs being arranged, cutlery being laid, and various pots and pans being carried back and forth drifted across the room as Alan and Susan sat for lunch with the congregation of an evangelical church in Pistoia, Italy in the October of 1998. As active members of City Church, Newcastle (which is part of the family of churches called New Frontiers) Alan and Susan were in Italy as part of an orientation team from New Frontiers who had a vision of planting a church in Italy.It would be their first venture to the Tuscan region, giving the couple a perfect opportunity to explore and sketch this beautiful area. Catching a train from Florence to Milan on the last leg of their trip, Alan and Susan fell in love with Florence from the moment they stepped foot in the station. 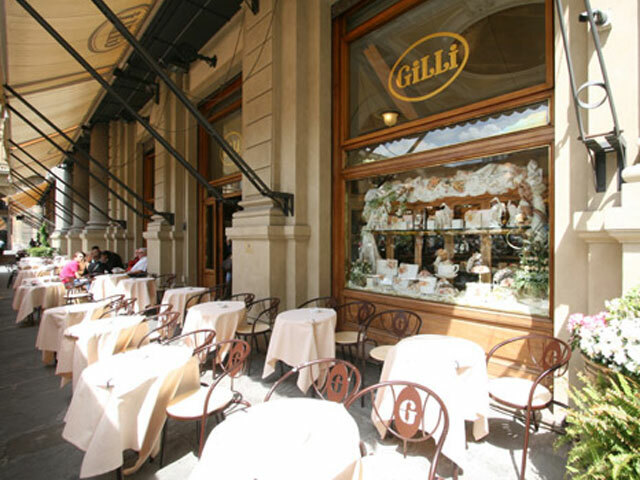 It was a beautiful hot sunny day, despite being well into October and the couple spent the day exploring the local shops, enjoying a coffee and people watching at the popular Café Gilli while Alan completed a sketch of the Ponte Vecchio, a medieval arch bridge over the Arno River. Unable to resist, the couple returned to Florence just four months later for their wedding anniversary in February. Drinking in the local culture, Susan suggested they embark on an adventure to San Gimignano – a small walled medieval hill town in the province of Siena, Tuscany that she’d spotted on a TV programme about the area. Fondly nicknamed as the Town of Fine Towers, San Gimignano is famous for its medieval architecture, its hilltop setting and encircling walls which form an unforgettable skyline. Sipping a glass of wine together and sampling the local wild boar salami as Alan painted the skyline beyond the piazza in which they sat, Alan vividly remembers his desire to capture the famous towers bathed in the warmth of the late Tuscan sun. The finished piece has become one of Alan’s most popular limited edition prints, often bought as a souvenir by customers who have holidayed here, but more surprisingly so as inspiration to visit this stunning location. Part two of this wonderful trip to mark their wedding anniversary together took Alan and Susan by train back to their beloved Venice. Alighting in the midst of the dazzling Venetian Carnival, the weather was a stark contrast to their last visit, but no less beautiful. Wrapping up from the bitter cold, the city was alive with the sights and sounds of the carnival, providing endless inspiration for any artist. The Venetian Carnival is an explosion of colour and spectacle during the month of February, starting 40 days before Easter and ending on Shrove Tuesday. Decorative masks and costumes are very much part of the festival – bringing the city to life from the cold winter frosts. 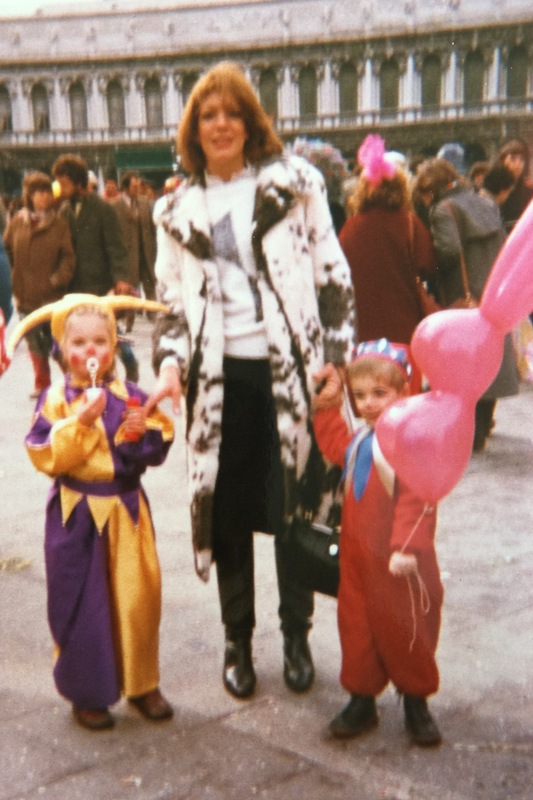 For Susan, who’s two young children took part in whilst the family lived in Venice many years ago, the trip was an unforgettable reminder of happy times spent here. For Alan, it was another opportunity to immerse himself in this vibrant city and its culture. Interestingly, the severity of the cold temperatures during the carnival meant that Alan had to find another medium if he was to capture this incredible sight, as watercolours would take too long to dry with such little warmth. Their trip to Florence and Venice for their wedding anniversary in February 1999 further fuelled Alan’s popular collection of Italian-inspired artwork – much to the enjoyment of customers who visited the Alan Reed Gallery regularly in Eldon Gardens and remain fans of Alan’s artwork and admire this incredible country and its culture. For artist Alan Reed, who regularly showcases his work through exhibitions in galleries across the world and in a permanent space in his home in Northumberland, it wasn’t until an opportunity presented itself in 1996 as part of the Arts Council’s “Arts 2000” project which sought to celebrate the artistic achievements of artists across the country from 1990 to the year 2000 that Alan considered the business of selling his art and a new commercial venture. It was an exciting time for all involved as the year 1996 was “won” for the North East by the regional art association Northern Arts. Bringing together the counties of Cleveland, Cumbria, Durham, Northumberland and Tyne & Wear, the region prided itself on listing more than 3000 exhibitions, events, commissions and residencies from March until December 1996. It was during this time that Eldon Gardens approached Alan about potentially installing his artwork in a “pop up” style gallery in their busy shopping mall. 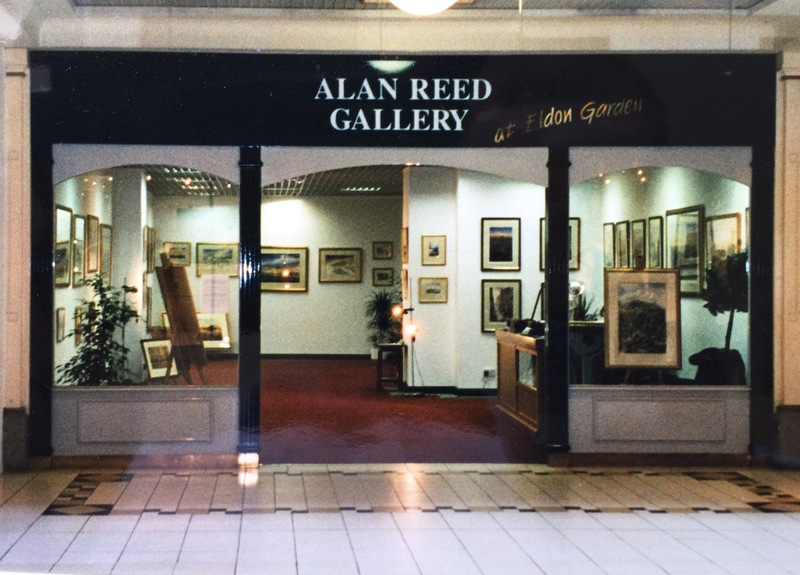 For six weeks, an empty unit within Eldon Gardens was transformed into a hive of activity – attracting shoppers, art lovers and tourists to the region, resulting in a phenomenally successful month of sales for Alan Reed Art and a boost overall in the community’s interest and perception of art. As the six weeks quickly drew to a close, Alan and Susan discussed the idea of opening a gallery full time within Eldon Gardens, having been inspired by the Arts Council’s initiative. With its crisp white walls and striking black exterior, neither Alan nor wife Susan could have imagined what the future had in store for the “Alan Reed Gallery at Eldon Gardens”. As the gallery flourished, Alan and Susan decided it was time to take another trip to Italy, this time to explore the idea of meeting a printer/publisher who could help promote Alan’s artwork across Italy – an idea inspired by the success of his Venetian themed artwork in an earlier exhibition “A Tale of Two Cities” at the Malcolm Innes Gallery in Edinburgh. The couple arranged to meet with a gentleman in Rome, whilst staying at a hotel in Campo de’ Fiori in Rome to discuss their idea. 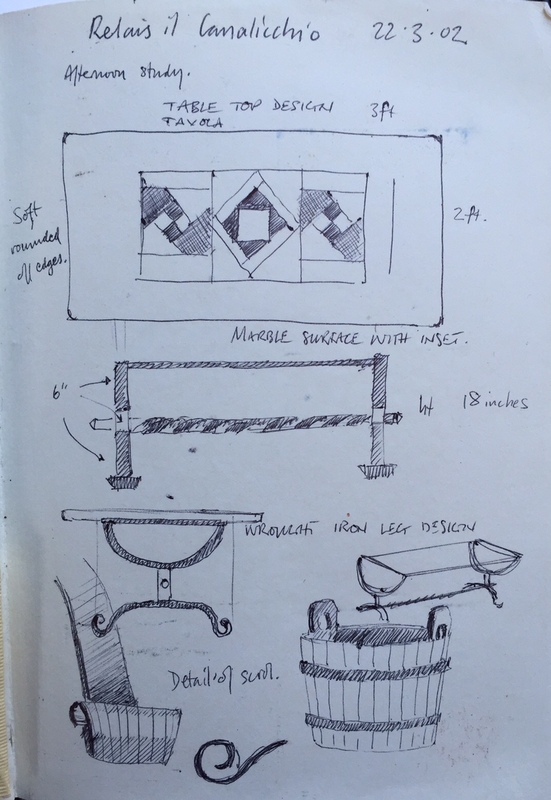 After two hours’ discussion, the couple had lots to think about and the week away spent exploring a new Italian city gave Alan the opportunity to sketch and further build his portfolio of Italian-inspired artwork. Having browsed various shops and markets for art to bring home as a souvenir of their trip, Alan and Susan were surprised to discover there were very few original paintings or prints they could buy, instead choice was limited to old engravings or amateur watercolour paintings sold for the equivalent of a few pounds at the local market. 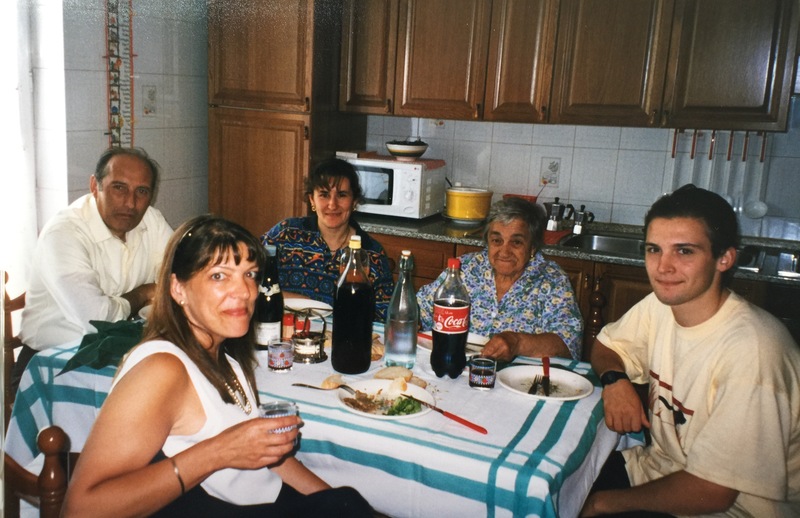 Alan and Susan enjoying supper with Susan’s old friend Maria Rose and her family – a snapshot of a typical Italian family meal and wonderful memories for the couple. In a twist of fate, Alan and Susan got into conversation with a couple from the South of the UK at the airport on the way home, who shared their frustrations that they couldn’t find any original artwork or good quality originals of Rome to take home as a souvenir. Laughing that he actually had some sketches in his luggage, the couple promised to visit the new Alan Reed Gallery in Newcastle and take a look. True to their word, the couple they met in the airport did pay a visit to the gallery and buy a print from Alan’s ever-expanding “Italian Collection” of paintings which also included scenes from Tuscany, including San Gimignano, Siena and Florence. What Alan and Susan soon realised is that they’d spotted a gap in the market for high quality paintings or sketches of Italy, and so Alan met with his printer Di Rollo whom Alan had worked with to publish his paintings of Edinburgh from 1993 onwards. Di Rollo spotted some of his Newcastle scenes in the Malcolm Innes Gallery in Edinburgh and the pair began chatting about the best way to create a series of limited edition prints from his original artwork to solve the problem. Giclée prints* had not yet become the popular, mainstream way of printing or reproducing original artwork as they are today and so the pair decided on a lithographic method to reproduce the prints. With the new gallery flourishing, his mind swimming with inspiration from another insightful trip to Italy and an exciting new distribution opportunity in the pipeline, 1996 was an exciting chapter in the story of Alan Reed Art – and one that continued right up until 2002 when Alan and Susan decided to relocate the Alan Reed Gallery back to their beautiful home in Northumberland. Moonlight shone brightly on the gently rippling waters of the Orseolo Basin, illuminating a shoal of gondolas tied together for the evening; a picture-perfect scene young artist Alan Reed would later capture during his stay at the historic Hotel Cavalletto on the family’s long-awaited return to Venice in 1994. His watercolour study of the hotel itself was bought by one of the North East’s most renowned opera singers Graeme Danby, signalling the beginning of something special for the 14 paintings Alan painted on this return trip to Venice. The view from our hotel gave us a wonderful view of the gondolas berthed for the night in the tiny canal below. The sweeping composition gave the impression of them being like a shoal of fish darting through the water. Staying at the Hotel Cavalletto for three days before moving on to Marghera in the suburb of Venice to stay with Susan’s friends Franca and her family, it was here Alan began to entrench himself in the Venetian way of life, often stealing himself away for a morning’s painting by getting the bus into Venice at 7am before returning for lunch at one o’clock on the dot – an Italian custom. The pace of life in Venice can be wonderfully sedate as Susan Reed knows to well, who went from rushing into town on the bus for the school run to waiting patiently to be sailed down the Grand Canal in a Vaparetto. Day trips to fair Verona, morning service at Chiesa Evangelica di Padova and boat trips to beautiful Burano to see its famous coloured houses, to Treviso and the coastal town of Chioggia with wife Susan and two children Louise and Oliver provided Alan with an abundance of inspiration for his artwork and fond memories for the young family. A city famed for its iconic architecture and the next big city to his home in Newcastle, Alan would often find himself on a train heading north and spend the day exploring Edinburgh and capturing its timeless beauty in his pocket sketchbooks…. Capturing the hustle and bustle of the crowds of Christmas shoppers on Princes Street on a late winter’s afternoon, or the dappled sunlight that bathes the old stonework of the Grassmarket, Alan’s artwork proved very popular with tourists and residents alike. Given the couple’s love of Venice, it’s no surprise that the Valvona & Crolla Ristorante and Deli in Edinburgh became one of their favourite restaurants to visit during their frequent trips to Edinburgh. Scotland’s oldest Delicatessen and Italian Wine Merchant; their visits were a dream come true for Susan who could buy fresh fruit and vegetables flown in from Milan that morning and pick up gourmet goodies that the family used to enjoy whilst living in Venice. The relationship between Edinburgh and Venice goes back to the 18th century when Edinburgh continued to expand rapidly. The medieval part of Edinburgh, now known as the Old Town was no longer large enough to contain the city’s rapidly growing population. A solution to the problem was sought in the form of a public competition inviting plans to develop the city. The young architect James Craig won – his plan being an elegant Neo-classical development located to the north of the castle. Building work carried out between 1767 and 1830 became known as the New Town and was noted as a huge success. The result was one of the most attractive cities in the whole of Europe, and Edinburgh was soon dubbed the “Venice of the North”. A chance meeting with his father and his father’s agent during a trip to Edinburgh later led to an exhibition of his work titled A Tale of Two Cities at the Malcolm Innes Gallery, Edinburgh in 1995. It was here that Alan drew upon the similarities between Venice and Edinburgh, two very distinctive cities in terms of architecture, but both equally as unique and enigmatic as one another. 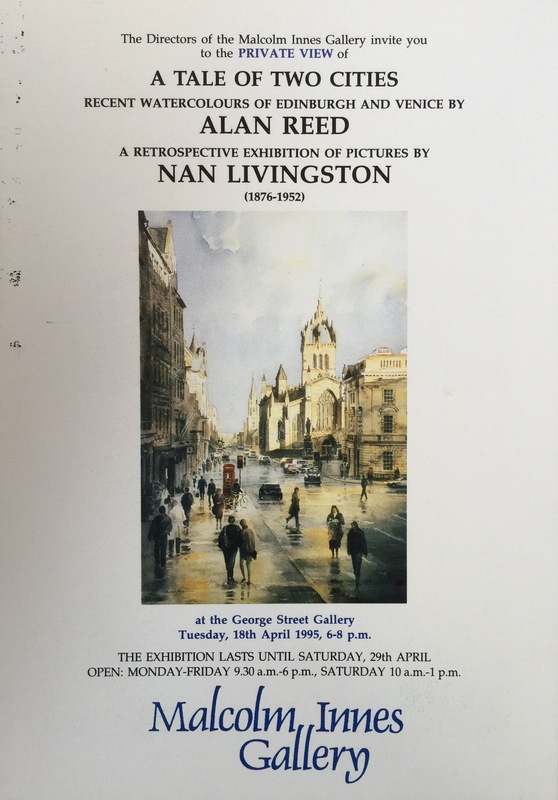 Showcasing his series of paintings from his trip to Venice a year earlier and some of his most popular Edinburgh street scenes the exhibition remains one of Alan’s favourite exhibitions he has curated throughout his career. As the exhibition opening date drew closer, Alan had planned to invite guests to a preview evening – only for their plans to be interrupted thanks to a postal strike, meaning very few people actually received their invitations to the event. In a twist of fate, this is when Susan joined the business and suggested they schedule an exhibition of the paintings in their home for those who didn’t receive their invites in time. Working tirelessly to call customers past and present, design new invitations and organise the event – A Tale of Two Cities part two was the start of a truly special working relationship for the couple, and an opportunity for families to reconnect as Susan reconnected with her father’s cousin Dr Alan Rutherford who was working in Edinburgh and spotted Alan’s artwork in the Malcolm Innes Gallery!